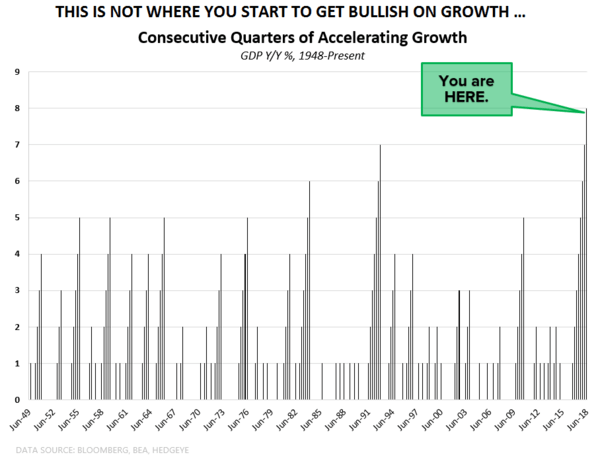 That’s one way to think about why you’re hearing about this record 8th straight quarter of year-over-year #acceleration in US GDP Growth being “sustainable.” For the likes of Steve Mnuchin and Larry Kudlow, there’s job security to think about! At one point yesterday, Mnuchin said that “we can only predict out a couple of years.” Really Steve? I would absolutely love to audit your predictive tracking algorithms to hold you to account on that. After having had a US GDP forecast above Wall Street’s going all the way back to the 2H of 2016, we’re now below consensus for the next 2 quarters at +2.44% and +1.10%, respectively. If we’re right, Q2’s #PeakCycle GDP report will appear unsustainable.